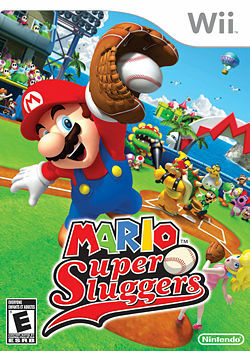 Mario Super Sluggers is the Wii installment follow-up to Mario Superstar Baseball. This game borrows many elements from the previous title, but it also includes new elements as well, including a variety of gameplay controls, such as taking advantage of the motion sensor controls that the Wii Remote provides. The game also has a more in-depth and more narrative driven Challenge Mode, where, rather than only facing off against a Team Captain and a team of opponents, players interact with more characters, including a variety of various sub-characters, and play various small challenges to recruit them for their team. Up to four players can play this title, and a new feature is that players can choose which of the two team sides to be on. It was released in Japan and North America in 2008. The game was never released in Europe and Australia, even after the Wii Nintendo Selects re-release. The game was re-released on the Wii U eShop in North America on March 31, 2016, and in Japan on August 17, 2016. The three control types, as shown in the instruction booklet enclosed with the game. Before a game starts, a roulette will start in order to show which team will be batting first. This is different from the previous game, in which the player could choose which team would be batting first. 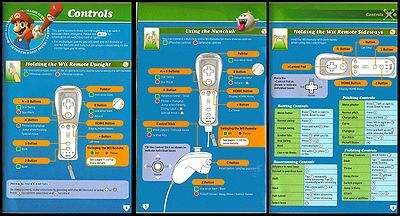 Assuming that players are using the Wii Remote (vertical) or the Wii Remote/Nunchuk combination, in order to bat or pitch, players must hold the button and the Wii Remote must be swung at the appropriate time. The more precise the hit/pitch, the further/faster the ball will go. To charge up a pitch or swing, players must pull the Wii Remote back. They can also do curve balls as well by twisting the Wii Remote, while pitching. Once the ball is in a fielder's hand, the Wii Remote must be swung so that the fielder can pitch the ball at one of the basemen. One outfielder tackles the ball and the ball rolls towards the outfielder with chemistry. The outfielder that holds the ball can then throw a very fast ball towards a base from the outfield. When a possible home run is hit, players can initiate a Buddy Jump. Upon jumping around another outfielder's head and pressing twice, one of the players will jump incredibly high to catch home run balls. This must be done with precise timing. Superstar Matchups return; however, it is set for captains only and occurs when the team captain is not batting first and when one runner is on second or third and two or all three runners on base (only when the runs exceed to 4 or more on the scoreboard). This also applies to RBI chance screens. While pitching, a character may show signs of fatigue, depending on how long they pitch. Letting up a lot of runs or using many Star Pitches factors into this, too. While pitching, however, players will have to pay attention to the pitcher's stamina. If the character that's pitching is showing signs of fatigue (depicted by a water droplet in a bubble), their pitches will start to behave in an erratic manner. When the current pitcher is exhausted, players will have to decide to adjust the defense so that a new character plays pitcher instead. On a side note, pitchers can get exhausted even quicker if the batting team manages to make a lot of successful Home Runs. Even a Grand Slam can cause a pitcher to become fully fatigued right off the bat. Star Skills make a reappearance in Mario Super Sluggers as well. Any player can pitch or bat using Star Skills, however only Team Captains can use special hits/pitches. Team Players can only use Star Skills that will make the ball go faster or slower. Both teams can store up to five Star Skill attempts; they are earned as a result of well executed plays. Mario wins MVP after his team (Luigi, Peach, Red Toad, Purple Toad, Toadette, Red Yoshi, Red Noki and Red Pianta) wins against the Wario Muscles. At the end of each game, the character who has had the most potential for their team will win the MVP award, which will be recorded in the Records menu. Characters can earn MVP points by striking out opponents, executing nice plays on defense, successful hits while batting (the batter has to make it to 1st base without getting out), stealing bases, close plays, and even for error item usage. The character with the most MVP points will win the award. Also, it's possible for more than one character to win MVP if at least two characters have the same amount of points. There are a total of nine stadiums (excluding Toy Field) in all. Every Team Captain (excluding Waluigi, Birdo, and Diddy Kong) has a stadium which is based on his or her character's unique persona. Most of the nine stadiums can be played in daytime or nighttime. Mario Stadium is the only one not to feature any gimmicks in the field, making for the most realistic baseball experience. Wario City is the only stadium that switches from day to night with no gimmicky changes. The Bowser Jr. Playroom is only accessible during the day, while Luigi's Mansion and Bowser Castle can only be accessed at night. These stadiums are accessible when starting a new game file. Upon meeting certain criteria during gameplay itself, these four stadiums will be available for access. Luigi's Mansion Ghost K In Challenge Mode, after opening the Pianta's shop in Mario Stadium and buying Luigi's Flashlight, Luigi's Mansion will open. Note that the night time setting must be unlocked before the stadium is usable. Daisy Cruiser Blooper Baserun In Challenge Mode, after opening Toadsworth's shop in Peach Ice Garden and buying a Cruiser Pass, Daisy Cruiser will be unlocked. Bowser Jr. Playroom Graffiti Runner In Challenge Mode, at least nine players must be found in the Challenge Mode Stadiums. Then, after beating Bowser Jr.'s team in the Bowser Jr. Playroom one time, the stadium will be unlocked. Bowser Castle Bowser Pinball In Challenge Mode, Bowser Jr. must first be beaten (said above). Then, Bowser's team must be beaten in Bowser Castle. All of the characters from the Mario Superstar Baseball game make a return appearance in Mario Super Sluggers. Additionally for this game, there are new participants as well. It is now possible to put more than one of the same character on the team in Exhibition Mode, as long as they are different colors. 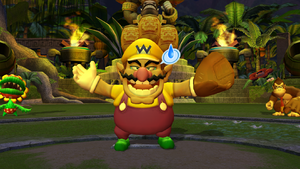 However, it is no longer possible to choose which hand that the characters will bat and pitch with; for example, players can no longer make Mario a left-handed batter. Players are given the choice to play as their Miis as well, whose stats are all 6/10. Players can't choose to have a whole team of nine Miis, but they can put one captain and up to eight other Miis. When characters become Star Players, their abilities are boosted by one point each. 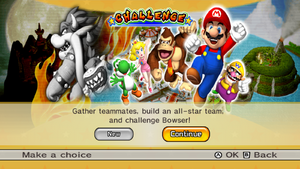 However, characters can only become Star Players by defeating Bowser's team in Challenge Mode. All team captains listed below in this section are available to be selected in the game's Exhibition Mode. Luigi, Daisy, Birdo, Waluigi, Diddy Kong, Bowser, and Bowser Jr. are only selectable as Team Captains outside of Challenge Mode. Also, depending on progress made in the Challenge Mode gameplay itself, players are only able to choose Mario, Peach, Yoshi, Wario, and Donkey Kong while navigating the Baseball Kingdom locale. Top-class speed in the field and on base. His speed and stamina baffles batters! Not all Team Players listed below are available from the start. In most cases, the player has to go through the Challenge Mode process and find the Team Players in question. Upon finding them, the player is given said tasks in relation to them (including specified Scouting Missions/Battle Missions). The tasks must be completed successfully prior to unlocking the Team Players for use in other modes for the game (in most cases, during the Exhibition mode setup process). Certain Team Players can also be unlocked by playing the other available modes in the game. The targeted Team Players in question are added to the overall roster for the entire game, provided that certain conditions are met. Small and fast, he's the master of close plays! An outstanding fielder who can also pitch. Owner of the wickedest curve around. A nasty curve makes up for a lack of power. A mini dynamo who can clamber and field! A well-balanced Toad who throws a decent pitch. A steal machine with speed to spare. A masterful pitcher who tires easily. Strong but slow, with a powerful arm. A speedy guy who runs faster with the ball. A defensive gem who can also climb walls. A powerhouse with slow charge pitches. A well-rounded player with a mean curve! Dominating bat and arm, but poor stamina. A brute whose glove work hides his slow feet. A good bunter who also pitches well. A defensive specialist with great hops! A steady bat with low power and some speed. Uses super jumps to catch high flies. His hammer can catch distant balls. A Dry Bones who can avoid most tags. Excellent bat control, but poor power. A decent player with poor defense. A power hitter who swings for the fences! A player with more speed than you'd think. An all-around player with a nice glove. A skilled bunter with good speed! A true master of the changeup pitch! A speedy Yoshi with all-around skills. A speedy Yoshi with a decent bat. A speedy Yoshi with a decent glove. An extra-speedy Yoshi who loves to run. A well-balanced Toad with extra batting power. A well-balanced Toad with a fine glove. A Toad with decent stats all around. A well-balanced Toad with a lively bat. A defensive specialist among Piantas. His brawn give pitches extra oomph! A defensive specialist among Nokis. A speedy guy with decent power to boot. A player who can use a spin attack. A balanced player with a bit of pop. A player with a mighty charge swing! A player who throws a mean curveball! A powerful Dry Bones with quick feet. A powerful Dry Bones with a good arm. A powerful Dry Bones with a good glove. A Shy Guy who loves to pitch! A Shy Guy who loves to steal! A Shy Guy who loves to hit and run! A Shy Guy who loves to play the field! Like Mario Superstar Baseball, the characters will have good and bad relations with any other character. However, the characters can make special abilities with another character when they show good Chemistry. The player can receive items with chemistry while batting. If the player is a batter and the next batter shares chemistry with the player, this will result in getting an item that can be used for messing up the outfielder's progress. Players that share good chemistry can also perform buddy jumps and buddy throws. Buddy jumps are used to take away a home run or a deep fly ball. Buddy throws are used to throw the ball faster and more accurate to its destination. Bad chemistry, however, results in slower throws, and sometimes throwing off track. Green Shell - Shoots at a player and dazes if it hits. Fire Ball - (unlockable, found in a Treasure Chest in Wario City) Some fireballs bounce to burn someone. Mini Boos (unlockable, found inside a Treasure Chest in Mario Stadium, and required to have King Boo join) - Makes the ball and its shadow invisible for about six seconds. The ball can still be caught and revealed. Does not work when a Star Swing is used. Bob-omb - When a Bob-omb gets shot in the outfield, it sits and stay until it explodes. When it explodes, anyone caught in the explosion gets knocked away. POW-Ball (unlockable, found inside a Treasure Chest in Peach Ice Garden) - All fielders are stunned by a small earthquake for about four seconds when it hits the ground. This does not affect levitating characters or if the characters jump at the right moment. If the POW-Ball happens to hit a player itself, then the player hit by it gets knocked away and the small earthquake caused by it does not take effect. Banana Peel - Five bananas are shot out to slip the outfielders. Challenge Mode makes a return in Mario Super Sluggers, returning as the Story Mode (and is the primary feature of this installment). The gameplay procedure for this mode includes a more in-depth story and an overall map screen involving the Baseball Kingdom locale. Along with recruiting players to go against Bowser's team, the players must solve from time to time certain puzzles and/or complete certain tasks in order to get to the main goals to proceed. Mario: Talking to plant life, such as flowers and hedges, and being able to use Warp Pipes. Peach: Being able to interact with things such as tree stumps, water, and etc. to make characters appear. Yoshi: Being able to use Manholes to reach other areas and Ground Pound the ground by trees to make characters come out. Donkey Kong: Being able to climb vines and smash wooden barrels and crates using his Hand Slap. Wario: Being able to pick up metal things with his magnet and open treasure chests. Mario and friends rushing into Mario Stadium, with Wii Remotes in hand. During the course of gameplay in Mario Super Sluggers, players are able to encounter certain cutscenes that correspond with the game's Challenge Mode. There are a total of four videos that can be seen by the player in this game, which also includes the game's opening (seen when the game starts up). Although the basic criteria still remains for players to encounter them during gameplay itself first, they are able to view the four videos outside of gameplay as well. These said videos can be accessed for viewing when the Challenge Mode category is added to the Records section (provided that the player has completed the Challenge Mode gameplay itself at least once). When viewing the Challenge Mode statistics in Records players can find the four videos in the Movie List sub-category. All of the players gathering around Mario and Luigi after Lakitu calls the final "out", and the ball game. Although this is seen for the opening of Mario Super Sluggers overall (after the game loads), it is still a combination of previewing the upcoming gameplay itself, as well as setting up what's to come in the game's Challenge Mode. This is the very first video the player encounters. The game's opening begins with Toad, Daisy, Mario, Luigi, Yoshi, and Birdo on a small cruiser riding to the Baseball Kingdom, which is the location where Mario Super Sluggers takes place. The cruiser arrives, and they meet up with Peach and Toadsworth who greet them at the entrance. Peach escorts them to the lighthouse at the Daisy Cruiser, showing them an overview of the entire locale. From there, they run into the Mario Stadium holding Wii Remotes (Briefly demonstrating the game's targeted controls). Closeups of Daisy, Luigi, and Mario follow in regards to swinging their Wii Remotes. Daisy is shown first encountering her Wii Remote changing to her bat. Luigi encounters the same result as Daisy, and Mario's Wii Remote changes to his ball. Mario pitches the ball to Daisy right away following this, and she is seen countering it. After Daisy countered Mario's pitched ball, the scenery immediately changes as the ball is chased after by Toad in the Peach Ice Garden until he runs into a large Freezie and turns frozen solid upon collision. He is later freed by a Blue Toad who accidentally crashes into the Freezie (with Toad revealing that he made the catch after being defrosted). The ball then rolls onto Wario City, where Wario chases after it to find it shoot into the air from a manhole water spout. The ball lands on Wario's head, causing him to fall backwards, and causing the ball to fly into Yoshi Park. Yoshi jumps over a pipe to catch the ball, realizing he is going to fall, he flutters around, but falls in with the ball. The ball flies to Diddy Kong at DK Jungle, where he is about to be run over by a barrel, when Donkey Kong rescues Diddy Kong by smashing it. The view switches back to Mario Stadium, where Mario pitches to DK, who then makes a hit. Yoshi goes for the catch, but both Wario and Waluigi bombard him with Bob-ombs. Yoshi slides to the catch regardless, throws it to Peach, who throws it to Mario, and then to Luigi on base. Donkey Kong rushes to the same base where Luigi is standing resulting in Donkey Kong slamming into Luigi, sending him into the field wall. As Daisy, Toad and other spectators stand in alarm, they find out seconds later that Luigi has caught the ball. Lakitu calls it out, and everyone rushes to center field where Mario and Luigi are standing. After that, a final overhead shot of the Baseball Kingdom is seen to conclude the opening. Mario and friends on a sailboat en route to the Baseball Kingdom. Peach at the entrance with Toadsworth waving toward their approaching friends. Peach escorts her friends upon their arrival at the Baseball Kingdom. Lighthouse view of the Baseball Kingdom. Daisy "demonstrating" the targeted gameplay; the Wii Remote changes into her bat seconds later. Daisy countering the pitch thrown from Mario. Peach (on the fielding end) about to throw the ball to Mario. Daisy and Toad in alarm after Luigi gets knocked off his base by Donkey Kong. Birdo, Daisy, and a few Toads run out to meet Mario & Luigi after Lakitu calls the final "out", and the ball game. This is the cutscene that is shown as the player is just beginning the Challenge Mode for Mario Super Sluggers. It takes place after Mario, Luigi, and Lakitu notice that there's something strange going on outside of the Baseball Kingdom. This cutscene starts with an overhead view of the Baseball Kingdom itself, but this time, through Bowser Jr.'s telescope. Bowser Jr. pulls a lever which results in his own stadium, Bowser Jr. Playroom, emerging from the sea. Then, with a large amount of force, he goes full speed ahead towards the Baseball Kingdom, resulting in his own stadium crashing headfirst onto the place. Mario and Luigi are surprised to encounter unexpected guests on their territory, which also include Bowser. If the player makes it to Bowser's Castle while it is night time in the Baseball Kingdom and defeats Bowser's team, then this is the main ending that is seen. Upon getting the final win, Mario and the other characters gather around the middle of Bowser's Castle to celebrate their victory. Bowser, in the background, is enraged and starts slamming his bat into the ground. Mario and the other characters later head back to the entrance of the Baseball Kingdom right as nightfall was occurring. After the sun sets, Peach's brooch lights up which magically lights up the island. Yoshi, Peach, Daisy, Birdo and Toad all celebrate the fireworks display and homerun event at Mario Stadium. This is the fourth and final cutscene for the player to encounter in Mario Super Sluggers. It is also triggered during the Challenge Mode gameplay after defeating Bowser's team a second time. Mario and other characters are celebrating in the Baseball Kingdom, and Daisy starts things off by inviting everyone to a feast at the Daisy Cruiser including Bowser and Bowser Jr. who get small portions of food. Moments later, the fireworks show begins and everyone is enjoying the display from the Daisy Cruiser. The characters are later seen at the Mario Stadium where Mario and Donkey Kong assist in the fireworks display that is also a homerun derby show as well; the two counter Bob-ombs that were shot out from the cannon across from them, which explode into fireworks. The spectators are amazed at the fireworks. Out of nowhere Wario and Waluigi walk up to the cannon and insert a Bullet Bill into the cannon. The cannon fires with the Bullet Bill aimed right at Mario. Bowser immediately drops in front of Mario where he counters the Bullet Bill using his bat, resulting in the Bullet Bill going the other direction now headed towards Wario and Waluigi who are running away. The Bullet Bill destroys the cannon in the process and manages to snag both Wario and Waluigi, taking them straight up into the night sky. After flying for a bit a large fireworks explosion from the Bullet Bill goes off. They begin to fall down in agony and despair from the explosion. Bowser limps away from the baseball field as the camera pans out. Daisy escorting Bowser and Bowser Jr. inside the Daisy Cruiser for the final festivities. Lakitu and Peach enjoying the feast held at the Daisy Cruiser. Yoshi, Daisy, and Toad seeing fireworks from the Daisy Cruiser. Peach and other various spectators enjoying the Bob-omb Derby/fireworks show at the Mario Stadium. Wario and Waluigi ducking under the cannon. Bowser drops in to counter the incoming Bullet Bill with his bat. Upon unlocking the "Movie List" menu (under the "Challenge Mode" category in "Records"), only the first three videos are able to be accessed (Game Opening, Bowser Jr. and Crew Crash the Party, The Hard-Earned Victory). The fourth video (The Final Festivities) is added upon reaching criteria to access it, as mentioned earlier. On that same menu which holds the four videos, there is also a link to view the Mario Super Sluggers game credits (which is mainly shown when the Challenge Mode gameplay has concluded after defeating Bowser's team). The credits layout includes a few snapshots from the four cutscene videos, as well as snapshots from the gameplay itself. In the second cutscene (Bowser Jr. and Crew Crash the Party), a Shy Guy, a Boo, and a Dry Bones accompany Bowser Jr. as he walks out of the Bowser Jr. Playroom. However, in the gameplay itself, Shy Guy is with the Yoshi Eggs team, while Boo is with the Wario Muscles team. In the third cutscene (The Hard-Earned Victory), Birdos of several colors run out and celebrate the victory against Bowser with the rest of the players. However, only the pink Birdo character is playable in the game itself. They also appear in the first and fourth cutscenes, however, here, they are not seen as players. In the fourth cutscene (The Final Festivities), when Wario and Waluigi are falling after being taken by the Bullet Bill to the sky, the "Γ" in Waluigi's cap is horizontally reversed due to a texture mistake. Toy field has returned from Mario Superstar Baseball. Toy field has one Batter, and three other Outfielders and a cannon that pitches the ball to the batter. Before it pitches it, there is a roulette wheel with three different slots that affects the turn. Each slot is controlled by one of the outfielders; the outfielders tap 'A' to stop the slot they are in control of. If the slots aren't stopped, they are stopped automatically. While playing the game, various records are kept to see what achievements players have pulled off. Players can check the top 5 scores for each minigame, along with the top 5 for Toy Field and Minigame Madness (the latter being unlocked by completing all the minigames at all skill levels). Players can check their status in Challenge mode by seeing which characters they've recruited, the badges that they've earned, along with the four cutscenes and staff credits. Players can check the former MVPs, the star players, badges, and the Minigame Madness records for each character here. Stadium Badge All stadiums must be available (on the active game file). Buddy Badge All characters must be unlocked; more specificially, all the Team Players have to be accounted for. Error Item Badge All Error Items must be available on the specified game file the player is using. Play Badge All minigames have to be won (all difficulites) and at least one game has to be won in the Toy Field. Star Badge All Team Captains/Team Players need to earn the "Star Player" rank (met by using those said characters in Challenge Mode during the final game against Bowser's team). The first eighteen "Level 1" cards featuring all twelve Team Captains and six Team Players. Nintendo of America created an online Adobe Flash program hosted at MarioSuperSluggersCards.com in which players can collect and trade virtual Mario Super Sluggers baseball cards featuring many of the characters, special moves, teams, and stadiums from the title. In addition to the cards, the game also allows players to earn downloads. By placing two compatible cards in the double play drop zone, players can make “double plays” and unlock special videos, wallpapers, and screensavers. 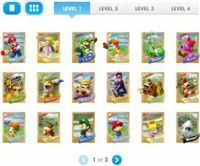 When a player completes his or her collection, a post featuring Mario and all of the cards is unlocked. In addition, his or her username will be added to the leaderboard below players who previously completed their collections. Over 700 users completed their collections. After creating a username and choosing which Mario Super Sluggers character to use as an avatar, players are instructed to click on special banners found on child-friendly websites around the internet in order to collect cards. Lakitu, who gives instructions and hints to the player, tells the player that the one banner can be found on Nick.com. Clicking on one such banner redirects the player to one of eighty-two Uniform Resource Locators (URLs), each of which corresponds to one of the eighty-two cards. The system is based on luck, but players are also able to trade cards with one another using the swap function or discuss where to find banners and which cards yield double plays. By checking their history, players have found ways to manipulate the system into giving them whichever card they wish. By checking their history, players can find which URL leads to which card and then share the URL with other players. The eighty-two cards are divided by rarity into four levels. Forty-one character cards make up the first level, twenty-four special swing/pitch cards make up the second level, twelve team cards make up the third level, and five stadium cards made up the fourth level. Each card has a front and a back. For the "Level 1" cards, the front shows the character's artwork, name, and for captains, the team they are captain of. The back shows the character's name, abilities, "rookie year" (the year their first video game appearance was released), description, statistics, and for captains, team logo. An in-game screenshot of the player is also featured. For a complete list of media for this subject, see List of Mario Super Sluggers media. 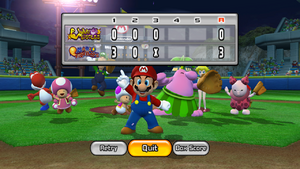 Mario Super Sluggers received generally positive reviews from critics. Cris Watters from Gamespot praised the game for how "The computer can provide a stiff challenge when set on a high difficulty level, and building your roster and lineup to capitalize on chemistry between your players is a fun exercise." and the fun multiplayer baseball gameplay although he criticized how the production values are not noticeably higher than in the original game, how the game was less challenging and complex than the original, and how there was not a good alternative to motion controls. Anthony Dickons from Nintendo Life praised how well polished the game is and criticized how it is based off baseball which produces a limited gameplay experience. Nintendo Life 7/10 Better than playing baseball, better than watching baseball, but it is still baseball. Fans of the sport or those who enjoyed previous Mario sports titles should find enough here for an entertaining time. Namco have included quite alot of extras, no doubt to compensate for the slight lack of depth in gameplay which is of no fault of the game but more the sport it tries to represent. Mario Super Sluggers is a well produced game which squeezes everything it can out of the genre. GameSpot 6.5/10 Despite its many shortcomings, Mario Super Sluggers is good enough to offer some solid entertainment to the right gamers. Collect-'em-all Mariophiles will dig the new challenge mode, and Wii party hosts will enjoy playing frantic multiplayer games. More serious baseballers will find satisfaction in facing off against one another, but will find the rest of the package wanting. While there's certainly fun to be had, it's a shame Super Sluggers couldn't find that balance between accessibility and complexity that has made past Mario sports games so successful. For this subject's image gallery, see Gallery:Mario Super Sluggers. "Clackety clack...(Must get diamonds... BASEBALL diamonds!)" Mario and Luigi's white pupils in their eyes seem misplaced, especially when they are using their Star Swings. Their eyes do not appear as this unless they are batting. If one counts the alternate team players, Mario Super Sluggers has the most playable characters of any Mario game, with a total of 71 playable characters. This is the only Mario-related Wii game to never be released in Europe and/or Australia in physical form.